Both Towns and Jahlil Okafor are exceptional talents and would be great players to have on a Minnesota roster that needs help. However, I think Towns is the better prospect and would be a better fit for a team with his inside-outside game on both ends of the court due to his length, athleticism and nice jumper for a big man. From the onset of his NBA career he should make a major impact on the defensive end with his shot blocking skills. And if he is able to work in a three-point shot as rumored, look out. Okafor would give the Lakers a very promising frontcourt along with last year's first-round selection Julius Randle, even as it could be interesting to see them fit together in the paint. Okafor projects to be an impact post scorer right away considering he has such an advanced set of moves for somebody only 19 years old. He may never be an elite defender or free throw shooter but he should develop into a solid rebounder. Philadelphia appears to be in good hand in their frontcourt with Nerlens Noel and Joel Embiid but they really need some help in the backcourt and specifically at the point. I think Russell would have the edge over Emmanuel Mudiay due to his strong perimeter shooting and his passing ability and ability to create for others should help improve a miserable offense. His defense shortcomings could be masked on this club with the aforementioned big men. The Knicks were, naturally, the biggest losers of the lottery and now it looks like they could try to move this selection. Should they stay at four, they will likely take the guard that Philadelphia does not take (although they are reportedly big fans of Justise Winslow) and here, that's Mudiay. Mudiay is a pure point guard which may seem like an odd fit for the triangle, nor is he a great shooter yet, but he can be dynamite with the ball in his hands. His selection could be a sign that the Knicks may not be as rigid with the triangle as previously thought. Orlando has the double-double machine of Nikola Vucevic in the mix but they need to find him a complement in their frontcourt. Porzingis would be able to provide spacing for not just Vucevic but the rest of the offense which could sorely use his outside shooting as the big Latvian has the shooting stroke that you normally see from a guard. He needs a good deal of polish and certainly needs to get stronger and tougher but he has shown some promise with his shot-blocking abilities. The Kings were a disaster defensively after firing Michael Malone and could certainly use the kind of defensive force like Cauley-Stein, who with his athleticism could defend almost every position on the court. He also would allow DeMarcus Cousins to play more power forward, which may be a better fit for his size and is reportedly something he wants to do. 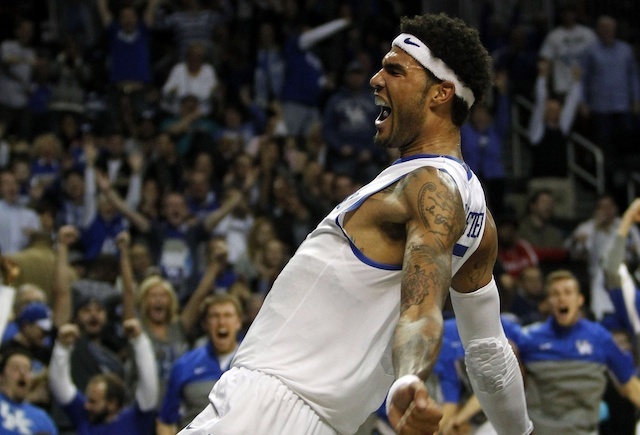 Cauley-Stein's still-developing offensive game would not be a worry next to the gifted Cousins. Denver could use just about anything at this point as their roster has become a mess with a dearth of talent and promise. I would look for them to take the best player available with this selection and that has to be Winslow at this juncture. He is still a little raw on the offensive end but he is efficient, is a solid passer, takes care of the ball and plays well without the ball. Where he will make his money in his pro career will be on the defensive end as he will be able to guard three positions at the next level, and we know that Denver could certainly use some help on that end. Caron Butler and Tayshaun Prince are the top options at the three for the Pistons at the moment and given that both are well past their prime at this point, the Pistons could sorely use a long-term solution at the position. Not to mention that as a team Detroit struggled from the perimeter this past season, and shooting is a weakness that Stan Van Gundy has expressed a desire in fixing, so Hezonja would be an ideal selection for them. He has an excellent skill-set offensively but he does come with questions about his demeanor and has to work on his defense. The Hornets could look to take a wing player with this selection given that Lance Stephenson was a disaster and Gerald Henderson is a free agent and given their major need for some perimeter shooting, taking perhaps the best shooter in the draft would make sense. Booker's stock is on the rise right now thanks in part to a stroke that looks league-ready even at 18. He has ideal size at 6-6 for the two-guard and he is also a smart passer while working hard defensively despite a limited wingspan. Pat Riley loves to take experience collegiate players and given that, and a roster that could use a little bit of help just about everywhere, could see the Heat taking the Wooden Award winner. Kaminsky would be an interesting fit alongside Chris Bosh given that both excel at spacing the floor and neither are natural rim protectors (in particular, Kaminsky is likely to be a mess defensively in the paint) but given that Dwyane Wade provides no floor spacing from the two-guard, such a funky lineup could work. Few big men have the kind of offensive skill-set that he has from his post game to his perimeter game. Coach Frank Vogel has made it clear that he wants the Pacers play a faster style of basketball going forward and it makes sense that they have reportedly taken a keen interest to the Racer point guard. George Hill is a fine point guard but you can do better and they have their reserve point guards entering free agency this offseason. He has excellent court vision and passes the ball very well, even in transition. His shooting can be a little streaky at times but he can get it to go from the perimeter. The Jazz, thanks to a multitude of high draft picks, have collected an intriguing amount of young talent on their roster but they could really use a guy like Johnson. Johnson could be the kind of defensive stopper on the wings that could really make this Jazz defense dangerous thanks to his size, length, athleticism and ability to defend multiple positions. For a perimeter player, he rebounds well and while it is not his strength, he can hit a shot from the perimeter. The Suns find themselves needing another piece to their frontcourt and the skill-set of Turner may not be tantalizing for them to pass up on thanks to the fact that he could help create spacing thanks to his shooting skills. Turner is raw and did not play a whole lot in his sole season in Austin, and his running style is raising some concerns, but a legendary medical staff with the Suns could help mitigate those concerns. You just do not see too many guys of his size with his physical attributes. It seems like the Thunder have for a few years now needed to build their depth on the wings and they have dedicated a number of draft picks towards that need. However, this would be the highest selection they have had to address that need and I could see them taking a stab at Oubre. Oubre was inconsistent as a freshman in Lawrence but he did show a lot of promise. He is long and athletic and shows all the skills to be a true presence defensively. Oubre's jumper looks to be where he will make an immediate contribution on offense. Atlanta had a brilliant regular season but even that could not hide the fact that they lack depth in their frontcourt. Now with Paul Millsap being a free agent this offseason, that need could only be exacerbated this offeseason. Now Lyles is young and raw but he has the skill-set that Mike Budenholzer likes from his bigs. He has the athleticism and the length, not to mention the shooting to be a stretch four. However, he does need to get stronger. The Celtics have built an intriguing frontcourt but they could use some further depth at the power forward position with Brandon Bass and Jonas Jerebko being free agents. Portis is not particularly athletic but he has an NBA body, he consistently plays hard and he has himself a solid offensive game with a solid jump shot that can stretch out towards the three-point arc. What he will also bring to the table that will be sorely needed in Boston is his ability to block shots. The Celtics had no player average more than 0.7 blocks-per-game this past season. Milwaukee has themselves a number of interesting and intriguing pieces on their roster, and they already appear set at the small forward position with Giannis Antetokounmpo. However, Dekker could make for an unique fit in the style that the Bucks have run under Jason Kidd this past season because of how well he can play without the ball. Dekker has seen his draft stock rise thanks to a strong performance in the NCAA Tournament and he showed some promise with his jump shot. Houston got some big-time play in big spots this postseason from Jason Terry and Pablo Prigioni. However, both are at least 37 and aren't playing on guaranteed contracts for next season while usual starter Patrick Beverley is a restricted free agent. Even if Beverley returns, the team should look to target a backup early. Grant does not have major upside considering he is already 22 but he is a great passer and, thanks to his athleticism and length, should be at least a decent defender at the next level. Paul Pierce has seen a good deal of minutes at the power forward position in this postseason and in the regular season and while he has made it work, it is obviously not a long-term answer. Looney is raw and is not likely to be an immediate contributor as he needs to get stronger and grow his post game. However, he has shown a skill for working the glass, specifically on offense, and his shot from three is very good for his position. Toronto was terrible at-times defensively this past season and their weaknesses on that end of the court was one of the key reasons why they fell apart and were swept by the Wizards in the playoffs. The Raptors are good enough offensively to cover for Hollis-Jefferson's mediocre jump shot but they could his defensive skills. His size, length and athleticism should allow him to defend multiple positions and he should be able to be a strong defensive specialist in the NBA. Well it is safe to say that the Rajon Rondo era in Dallas has come to a close. If and when he leaves Big D, it will leave a hole at the point as neither J.J. Barea nor the immortal Raymond Felton should be starting point guards in this league at this point in their careers. Jones was tremendous for the Blues Devils in the National Championship and that helped his stock. He may not be the impressive athlete but he has great handles and has tremendous intangibles. His jumper is also pretty good. It was a relative return to normality health-wise for Derrick Rose this season, but he still missed 31 games. Both of his backups, Aaron Brooks and Kirk Hinrich, are free agents and both of them are on the wrong side of 30. Wright already is 23 years old but while that may make his career a little shorter on the back-end, it also means that he should be able to contribute right away. He takes advantage of his size as a passer and he distributes very well. What new coach Fred Hoiberg will also appreciate is his game on the defensive end. The Cavs should be a title contender once again next season (having a guy like LeBron James certainly helps in that manner), but they could use some depth on the wings as J.R. Smith and Iman Shumpert both could leave this summer. Hunter is one of the best shooters in this draft from the perimeter and also is a smart playmaker with the ball in his hands. His defense is not a plus but Cleveland has the kind of players (read: James) that can help cover for him. Memphis is a club that has become a tough playoff out with some tremendous defense and a decided home-court advantage at "the Grindhouse," but one thing they have needed for years now is perimeter shooting. Anderson is a player that has worked hard on his jump shot and it showed as he was hitting 45 percent of his threes this past season in Charlottesville. Factor that with his talents on the defensive end due to his size, length, athleticism and ability to cover multiple positions and it sounds like he would be a good fit with the Grizzlies. The Spurs are still pretty loaded on their roster which, as always, allows them to take some risks on the draft day on either foreign prospects or raw college products. Wood would certainly be the latter as he is quite raw and probably would have benefited from a third year at UNLV. After all, he still is only 19 and has a long way to develop physically. That said, he has lottery talent as he has great length and a nice touch from the perimeter, not to mention some game on the glass. Upshaw is a significant risk from an off-the-court standpoint and he has been kicked out of two Division I programs. That said, he has the talent to be a serious contributor defensively given his massive size and length and he showed an excellent shot blocking ability during his short stint at Washington (and he would more a true rim protector than Portis would be). His offensive game is still coming along although he does finish very well. Given that the Nets are not likely to be a factor for a few years thanks to limited picks and financial flexibility going forward, they really need to add some youth and talent and should take some risks. McCullough was looking like a top-20 pick this season before suffering a torn ACL. Couple that with the fact that he is rather raw and that makes him a project. He does have the ability to shoot from three and moves well defensively while also having the ability to block shots. The Warriors have the flexibility to do just about anything with this selection thanks to such a deep and talented roster, and it could be difficult for this prospect to get much if any burn next season. That's why to this point I have had them taking a project here but now I see them taking Rozier, whose stock has been rising of late. Rozier's mediocre jumper would not be a concern with the Dubs while his ability to get to the tin and his tough defense could be useful off the bench. Check out the NBA Mock Draft database at Walter Football for even more mocks.